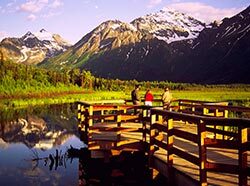 The Eagle River Nature Center, located just 45 minutes from downtown Anchorage on the northeast side of 500,000-acre Chugach State Park, provides an excellent starting point for hikes, nature walks, and wildlife viewing. While you can find wildlife throughout the surrounding area and along any of the four established trails from the Nature Center, two trails provide easy access to beaver and salmon viewing. The 3-mile Albert Loop Trail traverses wooded pond areas, often providing views of beavers. These chestnut brown rodents are fun to watch as they transport branches and logs for their dams, sometimes building water routes to float the heavy objects into place. Beavers are adept in water using webbed feet and broad flat tails to swim and dive. It's easy to imagine how the term "busy as a beaver" came to be because beavers work hard to build and maintain the homes they use to cache food and raise their young. Beavers add limbs and mud to their lodges every year and old lodges can be huge. A viewing platform adjacent to the Rodak Trail is a good place to see red and silver salmon spawning, especially in August. Watch for their colorful bodies as they struggle to reach their final destination: a spot to lay eggs. The ¾ mile Rodak Trail, a short self-guided nature trail, also includes interpretive signs with information about Eagle River Valley. The trails are also a great spot for year-round birding. The American dipper can be seen in area streams during the winter months. Winter is also a good time to listen for owls, including great-horned and boreal owls. Brown and black bears are often seen around the nature center. Brown bears feed on salmon in shallow water between the beaver dams. The Albert Loop Trail is closed in late summer to protect visitors who may surprise bears at close range. Watch animals from a distance and be careful not to disturb nesting or baby animals. Be aware this area is also home to bears. Avoid surprising a bear and be especially alert in situations where a bear's ability to see you is impaired, such as low light conditions, fog, or thick brush. Be careful when background noises such as rushing water mask the sound of your approach. Sing, clap or talk loudly so a bear can hear you over the noise. The Nature Center building and indoor/outdoor bathrooms are accessible via wheelchair and all interpretive displays can easily be read. The Rodak trail is a hard-packed dirt trail. It is the only wheelchair accessible trail at the center and is somewhat challenging. For easier uphill slopes, access the trail from the Iditarod Trail at the 400-foot point. Grades are steeper when descending, while the return from the valley floor has gentler grades. The viewing platform is accessible at .4 mile. 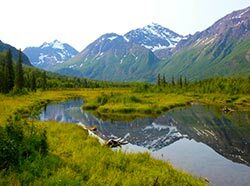 From downtown Anchorage, take the Glenn Highway to Eagle River Loop Road. At the third traffic light after the bridge, turn right on Eagle River Road. Follow this road 12 miles. The Nature Center and parking area are at the end of the road. Nature center staff offer two one-mile guided nature walks each weekday (Mon-Fri) from June to August. The walks are free and last 1.5 hours.